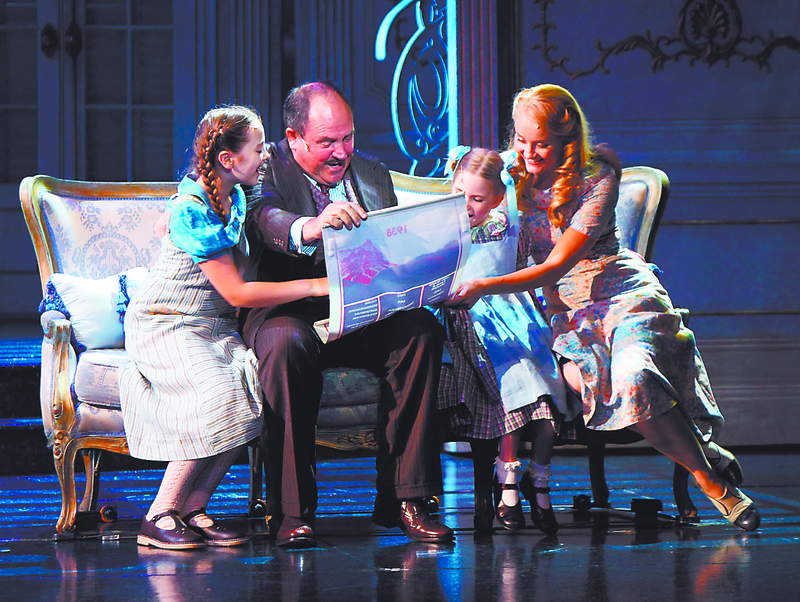 Hot off the press: Brigitta (Rachelle Weiss), Gretl (Ansie du Plessis) and Liesl von Trapp (Carmen Pretorius) examine the poster for their 1938 festival performance, with uncle Max Detweiler (James Borthwick). PHOTOGRAPH BY PAT BROMILOW-DOWNING. A knee-jerk response to the idea of another production of the Sound of Music, the inimitable squeaky clean musical that was played in many a household in the 1950s, 1960s and 1970s on LP records, is a groan. Do we really need to revive these old musicals with their outdated social values and silly costumes? We do, actually. The sleek efficiency with which this production has been streamlined, from grand set manoeuvres to a deep respect for the time-hewn music, unequivocally places The Sound of Music on a critical par with Jersey Boys and Chicago, for instance, award-winning musicals that graced our stages in past years. Jeremy Sams, an English director with West End credentials, yields a remarkably beautiful show, attesting unapologetically to the wholesomeness of the original; he’s supported by indefatigable Louis Zurnamer, who heads up a 13-piece orchestra in the pit. Against a backdrop of the Anschluss on the cusp of the Second World War, glancing head on at the moral choices facing ordinary Austrians at the time, the production would not exist without the children. Thus it is delicately structured to bring about juxtaposition of hard and soft – unsympathetic Nazis and singing children, a plethora of nuns, a love story that ends in marriage and the landscape between Austria and Switzerland. Not to forget the Edelweiss: the hardy white little mountain flower of the region. Bethany Dickson in the lead, who wowed audiences in Sunset Boulevard, is as blatantly fresh-faced as Julie Andrews was in the original film; she makes you fall in love with the idea of Maria who makes the nuns laugh and who softens the heart of a man in permanent trauma, armed with her carpet bag and guitar. Baron Von Trapp – Christopher Plummer in the original – is played by Andre Schwarz, with great suaveness. But what gives this particular production its critical edge is an almost sleight of hand sense of intricacy and authenticity. The Nazi presence is devastatingly real and the manner in which the abbey of nuns is brought to life on stage, is simply breathtaking, from not only a lighting and set perspective, but also supported by the rich voice of Janelle Visagie as the Mother Abbess, who incites a confused Maria to follow her dreams. Featuring performers ranging from seasoned James Borthwick, Mike Huff and Malcolm Terrey, to fresh faces like that of Mikah Jaye Smith (9), Lia Solomon (10) and Rachelle Weiss (11), the production is a sheer delight from beginning to end. And the songs? The songs are of everyone’s favourite things. They’re not “hits” in the popular culture sense of the word; instead they embrace emotional comfort that resonates with all good things from your childhood, like peanut butter sandwiches, warm ProNutro cereal and being tucked in bed during a thunderstorm. This beautiful slice of nostalgia will warm the cockles of any heart. The Sound of Music by Rodgers and Hammerstein, directed by Jeremy Sams is at Teatro, Montecasino Fourways, until June 2.